Two nights at The Old Church! 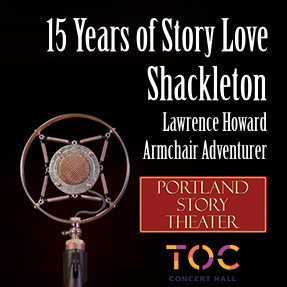 Shackleton, story that launched the Armchair Adventurer series returns to the Portland Story Theater stage with music and imagery. This is the gripping, heartbreaking, true story of British explorer, Ernest Shackleton, and the Trans-Antarctic Expedition of 1914. Shackleton’s dream of being the first to cross the Antarctic continent on foot became a nightmare when his valiant ship, The Endurance, was crushed in the pack-ice of the Weddell Sea. The story of how he and the twenty-seven men of the expedition survived on the ice and eventually came to safety is an epic tale of hardship and suffering, of courage, determination and fortitude. Buy a Fertile Ground Pass and designate Portland Story Theater so we can earn some of the proceeds from your purchase. Thank you!